It comes from, ‘The Crock of Gold’, written in 1912 by Irish poet, novelist and short-story writer, James Stephens. I admit, I don’t know his work at all. I found it in a dictionary of quotations when looking for something to express my views on perfection. I could have said, perfection is dull. Or, perfection is unattainable. Or, perfection is worth pursuing as long as you know you won’t get there. But I wanted something – perfect. I was thinking about this recently when we went to visit a potter in north Wales. We like pots. We have some fine examples of what is known as ‘studio pottery’. 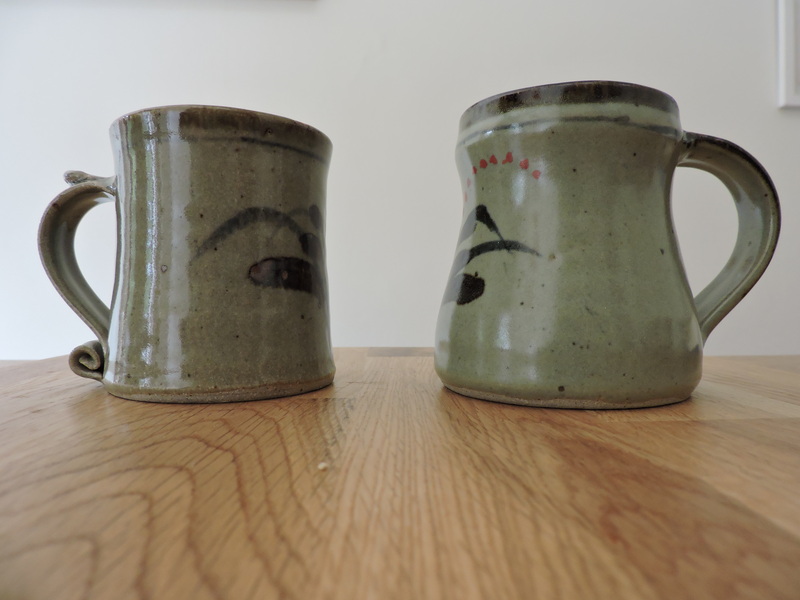 And lots of handmade plates and bowls, cups and saucers, jugs and mugs – vast quantities of mugs. Some of my favourite pots, though, are ones that tried but failed. Or did they? Is it all a bit subjective, this perfection thing? 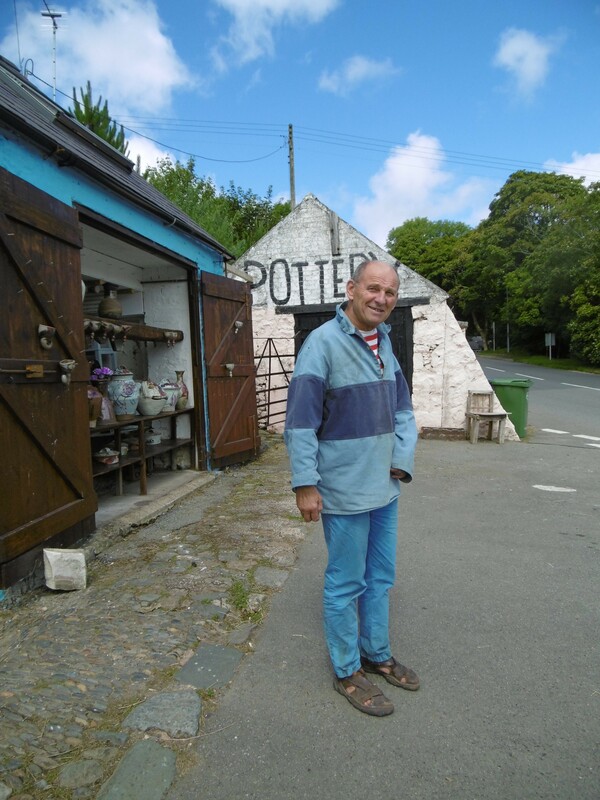 Long ago (the 1990s) and far away – 300 miles down south, in Devon – we went to visit another potter, David Leach. He was suffering from an affliction that, mercifully for him, was not permanent. He had no feeling in his hands. David Leach, son of that grand old man of British Studio Pottery, Bernard Leach, was then nearer to his ninetieth year than his eightieth. A lovely, unassuming, quiet man. At least, in our brief encounter he was – he might’ve been suppressing a rage that only surfaced at parties, but I doubt it. He showed us his big, plain potter’s hands. Showed us his pale palms. His blunt, solid, digits and thumbs. Unable to feel the clay forming shapes beneath them. Plainly unhappy and struggling to come to terms with it, he was hoping it would become better, one day. Worrying about the outcome an operation might have. 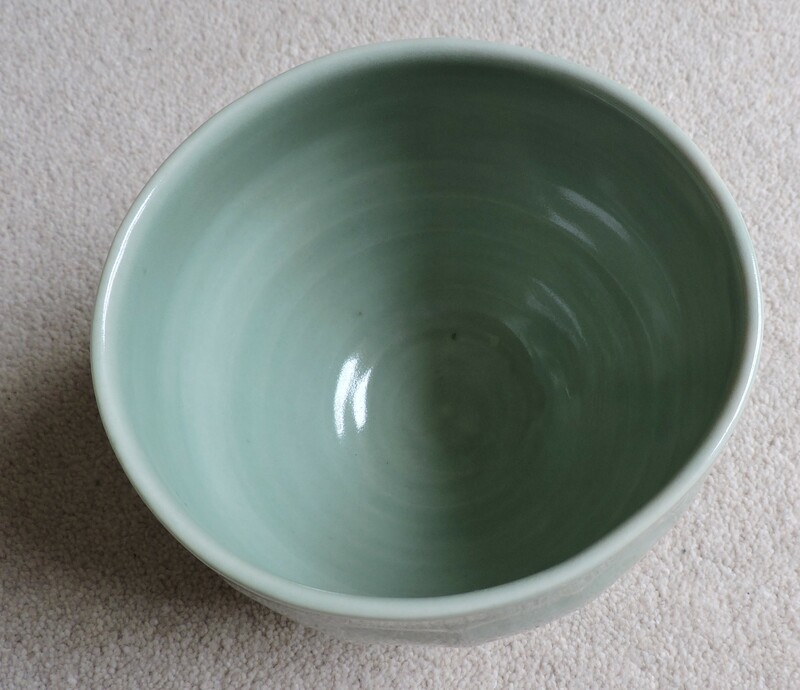 We looked at his pots and fell in love with a bowl with a celadon glaze – a beautiful, pale jade green (created by firing with a glaze containing iron). A classic style and shape. Of course we bought it, at an ‘ouch’ of a price. David Leach’s work was by then commanding very high prices. We felt like we’d bought a bit of the man himself. 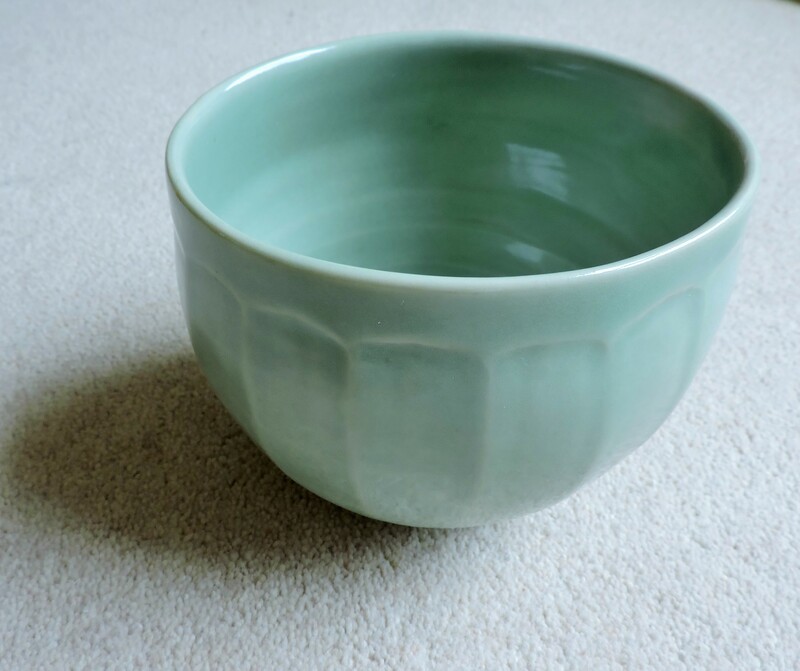 A deeply personal diary entry, written in a celadon bowl. A piece that spoke of the man nearing his ninetieth year, whose expertise was oh-so-close to perfection, but betrayed by his own body. His oh-so-experienced hands. Later, we received an invitation in the post to a viewing in a gallery in London – but we couldn’t go. And now Mr Leach is himself long gone. Oldrich Asenbryl, however, remains. In north Wales. Which is where we went to see him just the other day. In 1968 Oldrich came to Britain from Czechoslovakia. 1968. The year of the Prague Spring – and the Russian invasion that quashed it. One of the effects of the liberalisation early in that year was more freedom for people to travel. He was here when the Russians marched in – and has been here ever since. 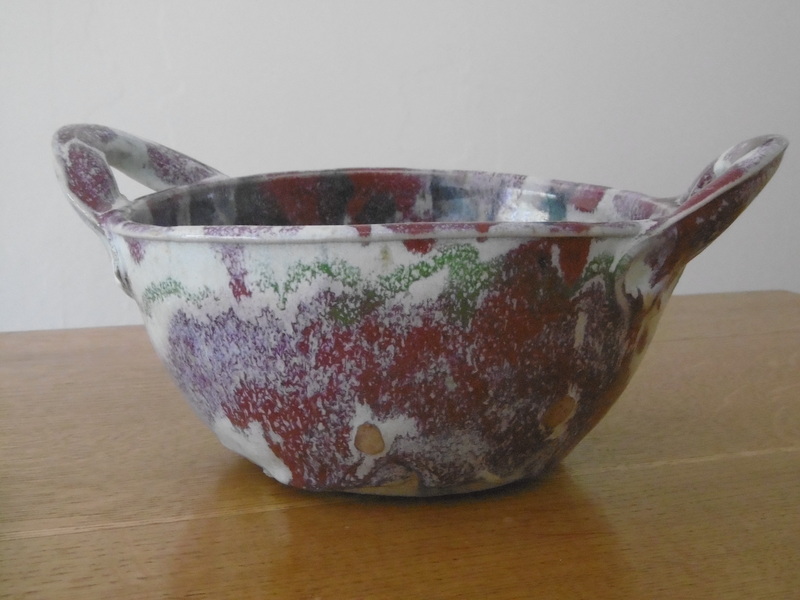 For two years he worked in Aldermaston pottery (under well-known potter Alan Caiger-Smith), then set up on his own in Wiltshire before moving, in 1973, to Wales. But then, in 1993, calamity. A stroke deprived him of movement in his left arm. His affliction is, barring miracles, permanent. He’s 72 now. Still a potter, with one fully-functioning arm. How could anyone make beautiful, useful pots with only one working arm? When we arrive he’s sitting in a deck chair in the rare north Wales sunshine. I notice that the sign, ‘Parking for Czechs only’ is gone from the window. But don’t know what that absence portends. The man’s struggle to rise has us worried, but not for long. Deck chairs are notoriously difficult to escape, even with two working arms. Soon he’s on top form. Quipping . Relating stories. Telling us to look around then stopping us by telling another story. Like a dentist asking you questions mid-filling. Remembering us – well, remembering the man, but mis-remembering me. I tell myself he’s confusing me with a rich woman, from a famous family, who used to buy his seconds. Though she also used to be a ballet dancer, so it’s rather unlikely. Outside, we admire the bright new paint job. Inside the lighter, airier displays. Then he points to the cuttings on the wall. The pictures of the aftermath of the fire. The fire that could have killed him had he and his grandchildren not been out for the night. The fire that destroyed all his stock – except for his ‘insurance policies’ in a separate building. Will he make more pots. I ask? A grimace is his reply. He hasn’t worked for ages. Seems the kiln’s broken, has been for months. He’s in a queue. It’s a rare thing, the skill needed to mend his kiln. I shouldn’t be surprised at this man. A wonky bowl for wonky fruit, perhaps? This man who puts his faith in God. Who decorates his shop with handwritten extracts from the Bible. Who despite a stroke can make beautiful, wonky pots with his one good arm. This man perseveres. Or as ‘The Dude’ – The Big Lebowski – might say, abides. Even if he’s ‘humbled’, as his handwritten sign proclaims. A wonky platter (with a beautiful glaze) for asymmetric hors d’oeuvres? 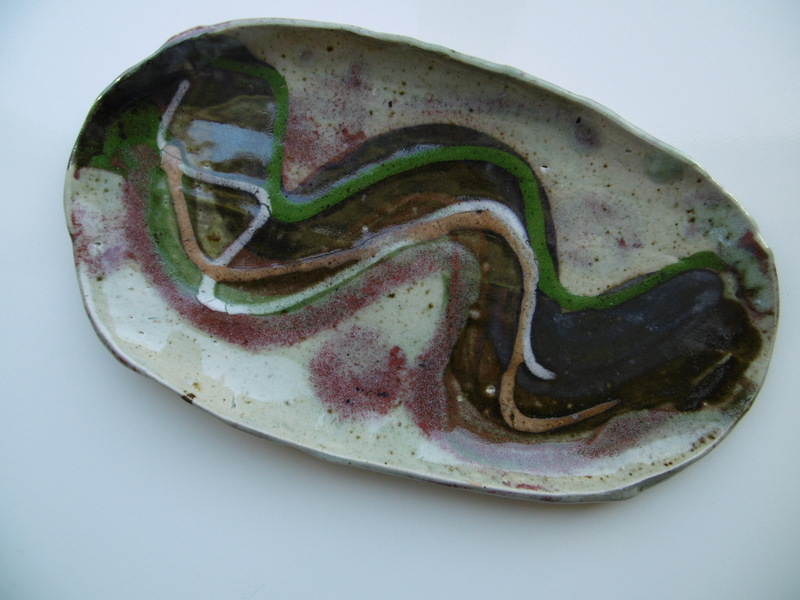 This entry was posted in Art, jaunts & going out, Llyn Peninsula and tagged Alan Caiger-Smith, Aldermaston Pottery, Czechoslovakia, David Leach, James Stephens, North Wales, Oldrich Asenbryl, Prague Spring, Sarn Pottery, studio pottery, William Morris. Bookmark the permalink. Why persons desire perfect in the natural eludes me. Surely it’s the antithesis. Perfect product with no personality nor person to spruik its provenance or story. Your preference for plates that come from a hand imperfect or no, provides such an antidote to consumerism, as do my forays to farmers markets or penchant for preloved; a chip here and there is no matter. One of my favourite bowls is a big blue wonky pottery dish that can be used for fruit platter or pie. Only yesterday I carted home from the framers a monster of a mirror created from a frame I found in bits discarded in a skip, which I glued, painted and had refurbished with the mirror. If we the creators, collectors and lovers of the perfectly imperfect persevere and prevail, it will forever live, attainable for those who have the eyes to see it and heart to want it. We have plates, mugs, bowls, vases made in Crozon, Finistère, Brittany, by Bruce and Catherine Gould, who studied pottery with David Leach. Catherine (French) made the pots, Bruce (Scottish) decorated them. They moved away in later years from utilitarian to decorative objects, which now fetch high prices. Catherine died two years ago of cancer at 63. As long as she could she worked hard to make a large stock of pots for Bruce to work on after she died. 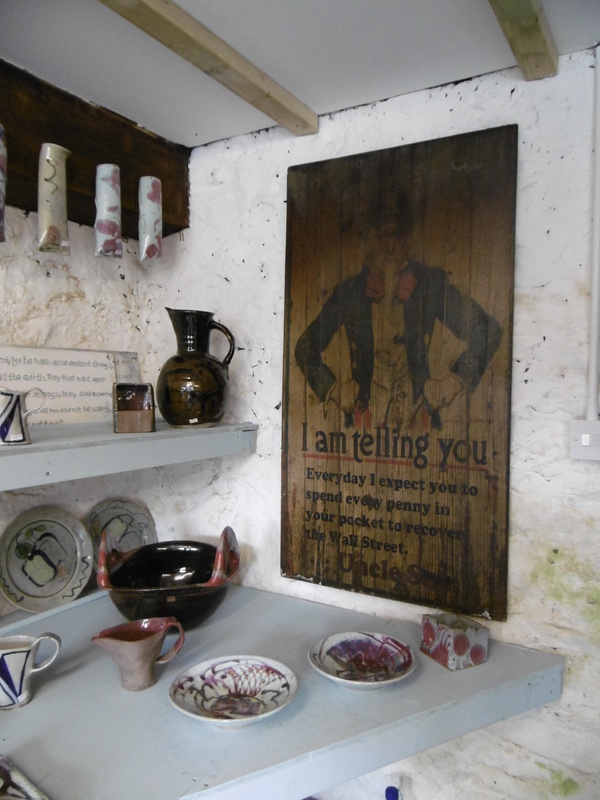 You can see some of Catherine’s later pots and Bruce’s paintings at http://brucecatherinegould.blogspot.fr. Much as the word “spruik” looks as though it should be of Dutch/Afrikaans origin, (“spreek” – converse, talk, speak; “spreuk” – proverb, aphorism, motto, maxim, saying) I found a Nederlands site which said of the word that “We hebben geen vertaling voor spruik in Engels” – “We have no translation for the English word spruik”. 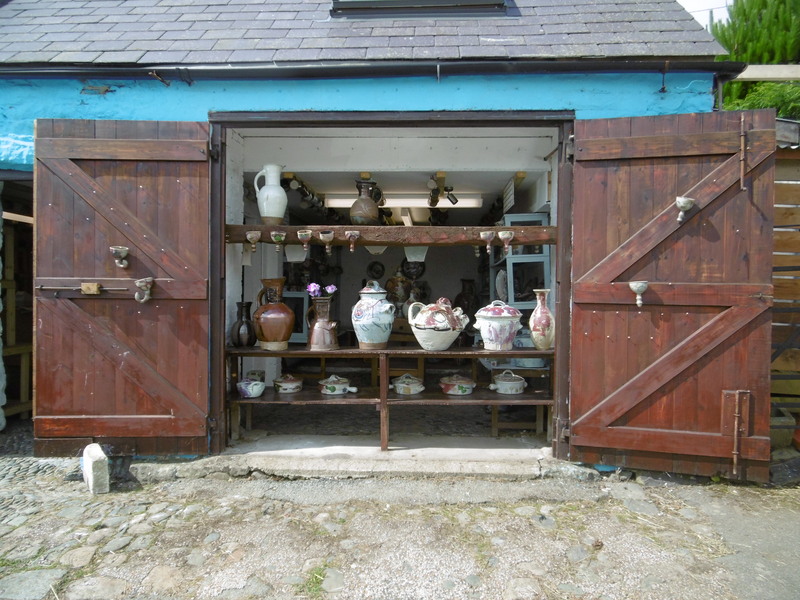 Was there last week bought a nice jug and enjoyed a chat, plus we parked outside. He told us that his best sales are to Scots. We travelled from Campbeltown, Kintyre. Not put milk in our jug yet as cobwebs in the display a bit off putting even though it has had a thorough clean. It’s not always guaranteed they adequately fulfil the function they seem designed for anyway, but they look good and are a talking point 🙂 and you’ve helped keep him in business a while longer, for which I for one am grateful.